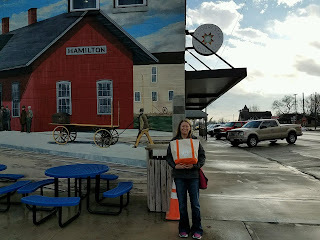 Missouri Star Quilt Company is celebrating their 9th birthday this weekend, so I thought I’d do a quick recap of the time I visited visited! I’ve been fortunate enough to visit around 30 quilt stores in person across six states. (Yes, I keep a list of the stores I’ve visited by city and state. I love LQS’s! 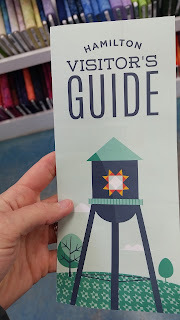 :)) One of my most favorite stores to visit so far is Missouri Star Quilt Company (MSQC). I’m sure you’ve heard of MSQC and have probably bought at least one of their fabulous online daily deals. MSQC is located in a very small town and is essentially its lifeblood. They currently have 14 different storefronts (with the intention to expand) in downtown Hamilton, MO. Essentially the downtown area is one main strip and most of it is occupied by MSQC. I imagine they employ most of the townspeople too. When we were back visiting family one holiday in the Midwest, I told my husband I wanted my gift to be a visit to MSQC. We loaded up and headed to Hamilton on a cold, gloomy day. The minute we drove into town, my face lit up like a Christmas tree. It was beautiful! We arrived around lunchtime so our first stop was Mama Hawk’s Kitchen for sandwiches. Then I visited the shops in their numbered order on their visitor’s brochure. Shop #1 is the Main Shop. It’s actually a touch of all of the other stores, so you see samples from the mercantile, florals, modern, baby and so on. There was so much to see and so much I wanted to take home! One of the coolest parts is that they have tablets set up so that you can check in to the store. If you have an online account, you can login and it will print out a badge with your name and hometown that you can use while shopping and accumulate your quilter’s cash! I bought several things in the Main Shop before moving on. After the first store, my husband and baby headed to Man Land to hang out while I shopped. I visited Missouri Star Mercantile, Florals, Primitives and Wool and Batik Boutique before stopping in at Man’s Land to check on my family. We all ventured to Sew Seasonal, MSQC Backings and Trims, Machine Shed, MSQC Modern, Licensed to Sew, MSQC Kids and Baby and Penney’s Quilt Shop. I made small purchases along the way. I also peeked into the Sewing Center and I’d love to take a class there one day. I made a final stop back in to the Main Shop – I had to pick up a few more things, before we stopped in at the Ninja Moose Brewery for some samples. After grabbing a last minute pastry back at Mama Hawk’s Kitchen, we started our journey back home. The experience was awesome! Each store stayed true to its theme and was filled with fabrics, notions and inspiration. The staff was incredibly friendly and helpful. I was literally giddy with excitement – and I imagine they hear that same sentiment from crazy quilters like me who come to visit. The Main Shop and MSQC Modern were my favorites. My family got full use out of Man’s Land – the perfect place to keep family corralled so that you have plenty of time to explore. I cannot wait to visit again! I’m hoping next time I can take my quilty friends along and maybe plan it around a retreat! 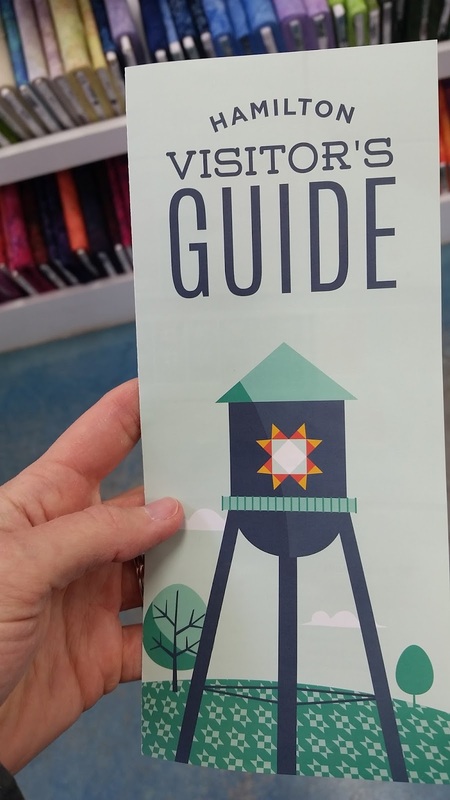 How many quilt stores have you visited? Which one is your favorite?